Rescuers Without Borders hasn't added a story. This sweet girl is Lucy. Like many other dogs we save, Lucy was in the landfill in Corum Turkey to fend for herself. She is a very sweet and social girl who loves and adores human affection. Lucy is a bit special as she is almost blind. However it doesn't discourage her love towards people and other dogs and she is full of life! Lucy needs help getting her freedom flight to the United States. She is currently in boarding in Istanbul Turkey and we would love to bring her here so she can start enjoying the American way of life! Any donation will go towards Lucy's vetting to prepare for the flight, her flight ticket, and travel crate. We greatly appreciate any help that you can provide to our sweet Lucy! Please note on your check what animal it is for. Rescuers Without Borders hasn't posted any updates yet. 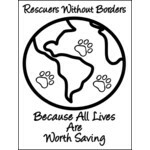 Rescuers Without Borders is managing the funds for this campaign.